Margo was first introduced to the world of horses through meditation. Within the stillness of her meditation practice, numerous images of horses came through with a persistent call to connect. Shortly after, they visited her dreams. The call was so strong, but because Margo could not understand it logically and had no previous horse experience, she shrugged off the invitation as insignificant. One day around this same time, a friend posted a picture of herself and her horse partner announcing participation in the Facilitated Equine Experiential Learning (FEEL) training at Mystic Waters Ranch. Sensing the deep heart connection between horse and human in the photo, Margo knew she had to visit the ranch to investigate what this intuitive pull was all about. 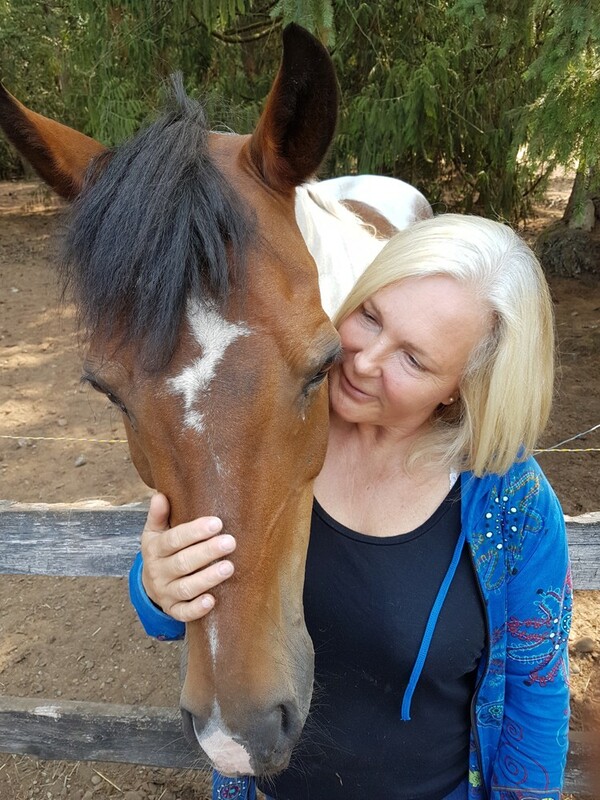 FEEL sessions with the horses and Facilitator Brenda Brown provided Margo with her most sacred and transformative healing experience to date. With a history of childhood trauma and PTSD, Margo had benefited from numerous, helpful therapies, but none impacted her quite like working with the horses. Because the horses are so grounding and gifted at bringing clients into the present moment, Margo was brought back into her body – probably for the first time since her childhood abuse. With newfound embodiment, she could deeply feel, heal and truly release the wounds from her past. From here the horses taught her how to respect her own personal space, recreate healthy boundaries, develop deeper heart connections, and live more authentically, peacefully and lovingly. The shifts in her life were profound after years of struggling with complex trauma and a decision was made to partner with the horses so that she too could hold the space for clients to heal in body mind and spirit. Her own experience confirmed that the emotionally intimate partnership with horses provides the greatest potential for health and well-being when compared to all other modalities. This is where she could best help others seeking respite, relief and a reconnection to Self and Source. Creating health and happiness has always been the driving force in Margo’s career, and many accomplishments support her work as a FEEL Practitioner. Margo is a Registered Nurse with a Bachelor of Science degree in Nursing and postgraduate training in Cognitive Therapy from the Beck Institute in Philadelphia PA. She obtained her Coaching Certification from the Coaches Training Institute and a second degree in Metaphysics from the University of Sedona. She is also an Ordained Minister with the International Ministry of Metaphysics and trained in both Reiki and Reconnective Healing. Daily spiritual practice also impacts Margo’s work and much of her inspiration comes from the teachings of The Science of Mind by Ernest Holmes and her meditation practice under Master Jin Bodhi at The Bodhi Meditation Centre. Lastly, Margo is trauma-informed so can educate her clients in stress physiology, the impact of trauma and various tools to release it. Should you choose to work with Margo, you will most definitely benefit from her expansive experience – however, you will be most touched by her generous and genuine heart. She has a fierce gentleness and strong feminine power that refuses to descend into judgement. In her presence, you will remember that you are able to love, have compassion, be truthful and honour what really matters to you whether it fits with contemporary cultural values or not. She is a spiritual leader and pioneer whose Soul Purpose includes healing and the empowerment of the Divine Feminine so that we might live in more balance as a species here on Earth. As a result, she will encourage you to live from your heart and help you realize that this is not only enough – but it is a blessing for All. It is her hope that your heart be touched by the horses as well, and that your FEEL experience with her and her horse partners promotes self-empowerment, awareness, transformation and an expansion of consciousness. Where horse interaction leads to human insight. ©2019 Horse Spirit Connections. All Rights Reserved. Horse Spirit Connections® and FEEL (Facilitated Equine Experiential Learning)® are registered trademarks of Horse Spirit Connections Inc.